Patient FAQ | Allard USA - Support For Better Life! Allard AFOs have helped over ½ million patients with footdrop. To read more inspiring stories, visit www.getbackuptoday.com. While you are there, we hope you will put yourself on the map! Customer Service and Support for Better Life are Allard USA's top priorities. That is why we have put together this page of Frequently Asked Questions for wearers of our Allard AFOs. We look forward to helping in any way we can. How do I know if I have Footdrop? Will an Allard AFO work for me/my condition? How do I get the ToeOFF®, BlueROCKER®, or Ypsilon™ brace? How much is the brace? Will my insurance cover the brace? Can I buy the brace directly from Allard USA? How do I find an orthotist in my area that can fit me with a brace? I need a new SoftKIT/Strap/Velcro Tab/Other Accessory. Can I order it directly from Allard USA? What kinds of shoes are best to wear with my brace? How do I clean my brace? What can I do in my brace? What are the limitations of my brace? Who might an Allard AFO not be right for? Are Allard AFOs covered by warranty? My brace is cracking and/or broken. What can I do? Foot drop, (sometimes referred to as drop foot) is NOT a disease; it is a symptom of an underlying neurological, muscular or anatomical condition marked by the inability to lift the front part of the foot. Foot drop can affect one or both feet. Depending on the cause, foot drop may be temporary or permanent. How do I know if I have foot drop? There are five braces within the family: Ypsilon®, ToeOFF®, ToeOFF® 2.0, BlueROCKER®, and BlueROCKER® 2.0. The ToeOFF and BlueROCKER products are also available in pediatric sizes, called KiddieGAIT® and KiddieROCKER™. Each brace is a technologically advanced, carbon composite orthosis that deflects in reaction to your weight and then reflects that energy to propel the leg forward. With varying supports, sizes, stability strengths and the ability to be highly customized, this dynamic ankle foot orthosis helps wearers walk with a more natural gait pattern. Will one of the Allard AFOs work for my condition? The best person to refer to on this question is either your primary care physician or orthotist. No one can evaluate whether Allard AFOs are right for you over the phone or via Email. If you need help finding an orthotist in your area, please contact Allard USA’s customer service team. Allard AFOs are all prescription braces that can only be ordered and fit by a certified orthotist. All you need to do is get a prescription from your Primary Care Physician or Physical Therapist requesting an Allard AFO (MAKE SURE THEY INCLUDE THE PHRASE “NO SUBSTITUTIONS” TO ENSURE YOU RECEIVE THE HIGHEST QUALITY PRODUCT). If you are not currently seeing an orthotist, please call our main office, where our friendly Customer Service Specialists will be more than happy to help you find one in your area. Bracing cost depends on several variables such as your insurance provider and how much customization has to be done to the brace. Your orthotist should be able to help answer any questions you have about general cost/billing. Allard USA is the manufacturer and distributor of Allard AFOs, and as such, do not deal directly with insurance companies or insurance billing. The facility where you are being fit for the brace should be able to help you with any insurance/billing/payment questions you may have. Allard USA does not sell directly to patients as the braces need to be customized and fit by a certified orthotist. Fitting by a trained and certified orthotist with the proper equipment will ensure that you will receive optimal performance, comfort, and longevity from your brace. Replacement accessories for Allard AFOs can be purchased from Rehabmart.com or by contacting your orthotist to order any replacement parts. If for any reason your orthotist cannot provide you with replacements or you don’t recall where you were fit for your brace, please call Allard USA’s friendly Customer Service Specialists to help you find a nearby facility that can help. What kinds of shoes are best to wear with my Allard AFO? The best shoes to wear with Allard AFOs are ‘rocker sole’ (also called rocker bottom) athletic shoes. There are two types of rocker sole shoes: 1. Stable, with a mostly flat sole that curves up near the toe to facilitate forward motion. 2. Unstable, with a curved sole from the heel to the toe. 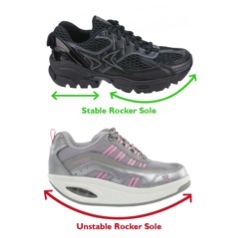 Be sure to go with a stable rocker sole shoe so as not to put undue stress on the brace. If possible, it is recommended that you avoid wearing boots, high-heels, or slippers with your brace. Your orthotist should be able to help you pick out the optimal shoe for your brace, but some recommended brands are Aetrex, Dr. Comfort, and Orthofeet. It is important to choose supportive shoes. Sandals and loafers do not offer sufficient support and should not be worn with your brace. Your orthotist fit your orthosis based on the height of the heel on the shoe you were wearing at the time of your fitting. Allard USA encourages you to speak with your orthotist before selecting shoes that have significantly different heel heights than those you wore during your initial fitting. It is recommended to have some type of interface or orthotic between your foot and the footplate. Your orthotist may have to place an insole or custom footbed on top of the footplate. If not, ask your orthotist what type of interface will be best for you. How do I clean my Allard AFO? It is recommended to wash liners and straps approximately twice per week. Follow the washing instructions on the liner. The brace itself can be gently cleaned with mild soap and water. What can I do in my Allard AFO? Many activities that individuals with a normally functioning gait do are possible in your brace. The activity level of those wearing an Allard AFO range from sedentary to very active (walking, running, cycling, triathlons, etc.). It is best to discuss your recommended activity level with your orthotist or primary care physician. What are the limitations of my Allard AFO? It is recommended that certain activities are modified to extend the life and functionality of your brace. When climbing stairs, the wearer should place their entire foot on the step instead of walking on the balls of their feet. Likewise, when climbing a ladder, the center of the foot should be placed on the rung to minimize weight bearing on the ball of the foot alone. Squatting should be avoided as it will significantly increase the stress on the brace and increase the risk of breakage. Take care to not leave your brace laying down to reduce possibility of someone stepping or sitting on it. Do not expose your brace to temperature extremes such as leaving it in a car trunk on a hot day or outdoors during extreme cold. Be sure to check the skin area around the brace as well as the brace itself every day for irritation or abnormalities, especially if there is reduced feeling in the lower extremities. My Allard AFO is cracking and/or broken. What do I do? Please contact your orthotist immediately so that they can order you a replacement brace. If you do not recall where you were fitted, please call our Customer Service Specialists to help you find a nearby facility that can help. Can’t find the answer to your question? Our customer service department is happy to help!